It is the ‘boy cried wolf’ syndrome. If you cry ‘anti-semitism’ for long enough when it doesn’t exist then when it does exist don’t be surprised if people turn the other way. At a meeting called by Bricup on December 4th to support the Boycott of Israel one of the 2 speakers, Bongani Masuku, was disgracefully attacked as an anti-Semite. In fact he is nothing of the kind but some jumped up South African quango decided that his anti-Zionism was a form of ‘hate speech’ [reactionaries don’t like the word racism, it’s too closely connected with socialism and imperialism and opposition to oppression]. Bongani after all was speaking alongside a Jewish speaker, former South African Police Minister Ronni Kassrills. But then Kassrills is an anti-Zionist so his views no doubt don’t count. When Jonathan Hoffman, notorious clown and Vice-Chairman of the Zionist Federation got up to attack Bongani as an ‘anti-Semite’ etc. he was, quite rightly, vigorously heckled. Note he wasn’t, like anti-Zionists at Zionist meetings, physically attacked, punched etc. Two weeks, yes two weeks later, the heckling of Hoffman had become anti-semitic! Apparently ‘Jewish’ and ‘Jew’ had been hurled at him. He hadn’t complained at the time but when a Tory student activist, Raheem Kassam made this allegation, Hoffman suddenly realised he was a victim! And Hoffman? No doubt he will continue to see anti-semitism where it doesn’t exist and miss it where it does. Hoffman of course, like Gordon Brown, is partially sighted. He just can’t see racism when Jewish settlers displace Arab families in Jerusalem or Arabs are not allowed the same water rations as Jewish settlers on the West Bank or when Arabs are told they can’t travel on Jewish settler roads, or the multitude of other forms of discrimination [only Palestinian children can be imprisoned etc.]. But when it comes to ‘anti-semitism’ he is ever alert, nose twitching, for the slightest sign of ‘anti-semitism’. We hear he is now trying to claim Marek Edelman, the last Commander of the Warsaw Ghetto Uprising for the Zionist cause, even though he was an anti-Zionist member of the Bund and compared Palestinian fighters to the Jewish Fighting Organisation in the Warsaw Ghetto. By the way, I had an amusing exchange with Hoffman on his CiFWatch. He accused a Holocaust survivor of being a Holocaust denier! Talk about Orwellian logic! Please change the title of this post which is defamatory. I have removed the first mention of the BBC, in order that there is no suggestion that the BBC directly accused Jonathan Hoffman of lying. The rest of the article stays as it is because the clear implication of the BBC finding is that he did lie. Just as the CST refused to record the complaint of 'anti-Semitism' with Mark Gardener even making a fatuous distinction between 'hate speech' and 'anti-Semitic hate speech'. The JC under Stephen Pollard, the ex-Daily Express journalist, is no longer a paper of record. Quoting yourself in the JC is a form of vanity publishing! I should also say that the only story is how a Tory student activist deliberately manufactured a story, which the BBC uncritically took up. When people were made aware of the recording of the debate they dropped the story and you Jonathan Hoffman like a ton of bricks. As correspondents on BBC 3's discussion have made clear, you don't listen to any voice but your own and your defence of every action of the BBC - right or wrong - simply gets up peoples' noses since they can see with their own eyes who bombs who and who is the most powerful in the Middle East. Your inability to understand, still less take on board, the arguments of those you disagree with is what is making you a one man disaster area for Zionist public relations in this country. Hence why I hope you are re-elected! Tony, you refer to the 'Zionist's' Community Security Trust ; aside from your incorrect puncutation (it should be 'Zionists' ') the CST is not an agency of any movement but is there to protect the entire Jewish Community. 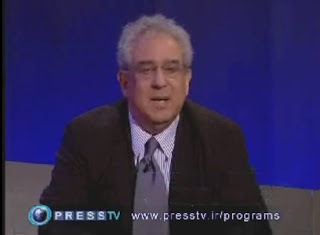 Finally, it should be noted that in recent years, when I moved from a successful career in television and film drama to being a political journalist I have developed high blood pressure, irregular heartbeat, diabetes 2 and a recurrence of cancer all of which I attribute to the stress of being screamed at and shouted down by pro-Palestinian and anti-American hecklers. The difference between Jonathan and me is that he stands up to this and speaks out about it. He is not a clown but a man of courage. That may not be a lie (quite) but it is deliberately misleading, claiming to hear something (convenient to his distorted view of the world) that was not there. He may genuinely have convinced himself that something not there was not happening. However this should also lead any independent observer to seriously doubt his account of anything else. "I will be seeking a prosecution of SOAS under the Public Order Act"
"Additionally there was the chant of 'Jewish' directed at me." and so on - puffing himself up with misplaced self-righteousness. "Hence why I hope you are re-elected!" Anonymous: I stand corrected on the grammar though really it was a type as I had the apostrophe in the right place but another one crept in too! As I don't know your name I cannot comment on your specific circumstances. I don't know why people aren't more honest about their names but I take the view on the blog that as long as they are not abusive or overtly racist etc. then I will post. Actually JH could be a clown and a man of courage! After all, who says that a clown can't be courageous? Wasn't there a clown in one of the Bond films who was killed who had that characteristic? I say JH is a clown because he comes over, and I mean this as no insult since my son suffers from the same, as autistic. I mean a singleminded concentration such that they simply aren't aware that there is any alternative argument and so JH is reduced to mouthing slogans. Now many on the left do that and that accounts for some of its weakenesses but someone who is in the position of JH should be able to take on board an argument in order to disagree with it. I've seen no sign JH does such that he antagonises even the most liberal and wishy washy supporters of the Palestinians (in my view of course!) - the kinda people who if there is no fence to sit on will go and build it. In other words JH's tactics are counterproductive even from his own point of view. Now I am someone who is universally condemned as an extremist. I hold a position on Palestine that the Israeli Jews are not a nation (and of course the Jews aren't). I have always opposed 2 states on principle because I know where they will lead (Ireland). But JH doesn't seem able to take on board there are different shades of opinion and thus helps solidify the opposition rather than weaken or splinter it. JH also cannot admit he is wrong, ever. It is obvious over this anti-semitism nonsense and the BBC statement that he was the victim of some silly Tory student prankster trying to make a name for himself. The clever thing to do would have been to say that he was unaware of anti-semitic abuse and would want to look at the evidence first. Instead JH sought to make a cause celebre out of nothing. And in the process put quite a number of peoples' noses out of joint. It is noticeable that all JH's comrades [do they use the term 'chaverim' any more?] and associates have been conspicuous by their silence. My advice, for what it is worth, to JH is to stop using accusations of anti-semitism as the first line of attack. Especially when your friend sieg heils and gives the salute at an Auschwitz survivor. That is anti-semitism - pure and simple. And no, the CST does not defend the whole community. If it did why weed out anti-Zionists and Jewish Socialists (the JSG is not anti-Zionist it is non-Zionist) from Jewish events? That suggests to me that it has a hidden agenda or rather a Zionist agenda. As for Jonathan's election chances as future Chairman (?) 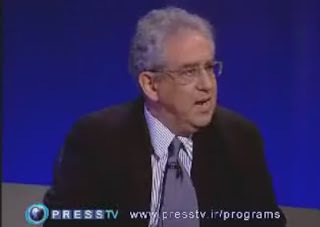 of the Zionist Federation. Unfortunately I have no vote but if I did Jonathan I would certainly vote for you. You really do make our job easier by demonstrating that Zionism is about the denial of Palestinian rights and their own experiences and beliefs. I'm bemused that Hoffman quotes from the JC to prove his point. Doesn't he realise how little we take that rag seriously? And how rich for Hoffman to accuse Tony of defamation when he constantly makes defammatory accusations, e.g. calling us liars, anti-Semites, racists..and calling a Holocaust survivor a Holocaust denier! But his remarks are too stupid to be taken seriously. I noticed on the BBC radio 3 message boards that he kept asking people to retract their comments and apologise. Imagine, if we did that every time Hoffman said something offensive, we'd never have time for anything else! I find his position, like most right-wing Zionists, to be racist against the Palestinians. 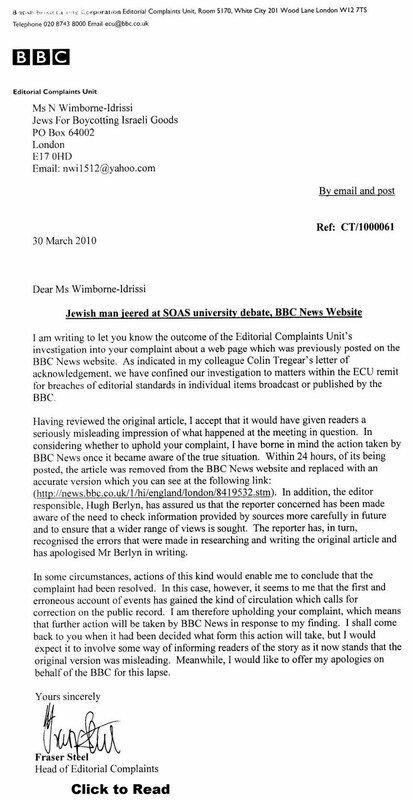 I had to laugh at JH's suggestion that I "twisted the BBC's arm" and forced them to change the story which invented the tale of racist jeering at the SOAS meeting. If only! Here's what really happened in the real world. As soon as people who had actually been at the meeting saw BBC Online's fabricated story, they phoned up in droves to point out that the audience was full of Jews, no-one said Jew or Jewish, Hoffman was jeered because of his well-known politics, not his Jewishness, etc etc. It took the editor in charge about 30 seconds to realise his reporter had been hoodwinked and the story had to be changed. 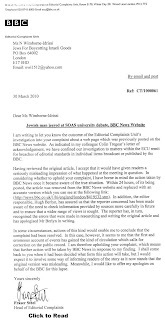 Even Raheem Kassam, who originated the whole pile of nonsense, had the decency to acknowledge there was some controversy and put the re-written BBC report on his own website. Unlike the Jewish Chronicle which is still carrying the original heap of twaddle unamended, deliberately denying its readers the truth. Nothing new there, then. How Low Can the Zionists Stoop?